I'm dreaming about our next great foodie adventure coming up at Boma in Disney's Animal Kingdom Lodge. Boma is located on the first floor of Jambo House serving breakfast and dinner daily in a 270 seat restaurant. The theme is designed to resemble an African marketplace with chefs attending wood burning grills and rotisseries. Boma is a buffet with pods (serving stations) that offer exotic dishes from over 50 different African countries. 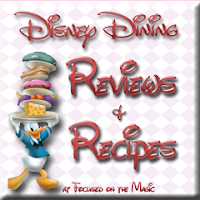 It is 1T on the Disney dining plan. 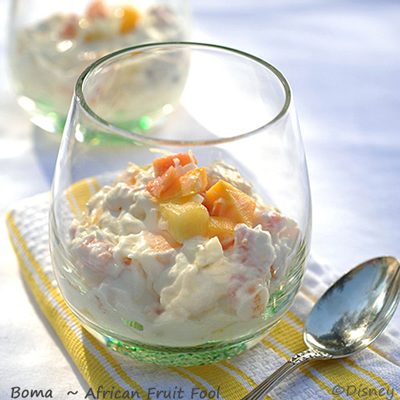 African Fruit Fool is a refreshing dessert that has become a favorite. the recipe is super easy to follow. 1. Combine pineapple, apple, mango, papaya, grapes, bananas, and coconut in a large bowl. Gently stir to combine. Stir in sweetened condensed milk. 2. Whip cream until soft peaks form. Add vanilla and continue to beat just until stiff peaks form. Working in batches, gently fold whipped cream into fruit mixture. 3. Cover bowl with plastic wrap. Refrigerate until cold, approximately 30 minutes.